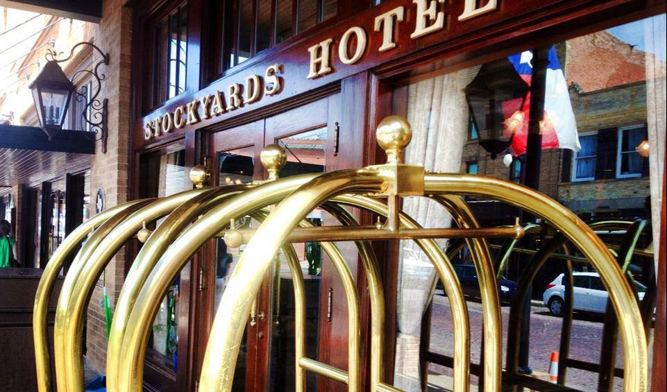 The Stockyards Hotel is located in the heart of the National Historic Stockyards District. The Stockyards Hotel is conveniently located 2 miles from downtown Fort Worth, 15 minutes from Texas Motor Speedway and Alliance Airport and 35 minutes from Dallas/Fort Worth Airport (DFW). Fort Worth’s legendary Stockyards Hotel has been welcoming guests since first opening its doors over 100 years ago in 1907. The spacious lobby of the Stockyards Hotel is beautifully appointed with comfortable furniture, antiques, and objet d’art that create an elegant Old West ambience. Cowboys and cattle barons, kings and queens of country music, even an outlaw or two have found refuge and romance at the Stockyards Hotel. Patrons have journeyed from near and far by foot, horseback, stagecoach, motorcar and plane to enjoy the incomparable hospitality of this premier hotel.